The 13th edition of Nuit Blanche Toronto presents over 75 contemporary art projects by more than 300 local, national and international artists. Nuit Blanche Toronto is a free, annual, city-wide celebration of contemporary art, produced by the City of Toronto in collaboration with Toronto’s arts community. “For the edition of Toronto Nuit Blanche 2018, I fell attracted by the possibility of making the installation of “Walk among worlds”(*) in Scarborough Town Center and including, as a parallel event, a performance to be carried out by many volunteers. According to a choreography that we’ll develop, the volunteers will carry dry trees in the same manner that flag-bearers carry flags (**). 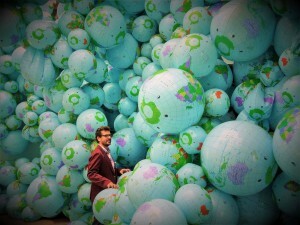 The connection between “Walk among worlds” -colorful multi-sized breathing globes which portray the contemporary political division of the planet- next to a ‘parade’ of volunteers carrying dry trees as if they were carrying flags, can produce a powerful awakening of ecological, political, social, and artistic dimensions.” – Maximo Gonzalez for L’officiel USA. (**) “Flag-bearers” (Manifesto (flagman trees)) was supported by the Lucas Artists Program at Montalvo Arts Center and premiered in July 2016 as part of the outdoor exhibition Five Hour Sculpture.